This has to be one of my favorite meals to make for friends on a warm summer night! 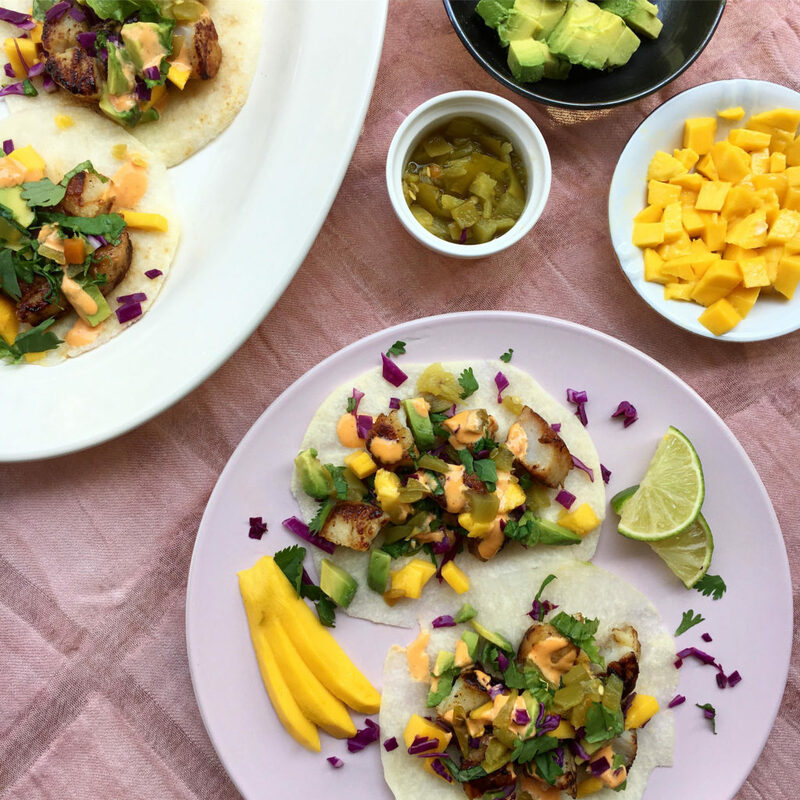 The jicama “taco shells” act as a substitute for fried taco shells with all the crunch but none of the fat. 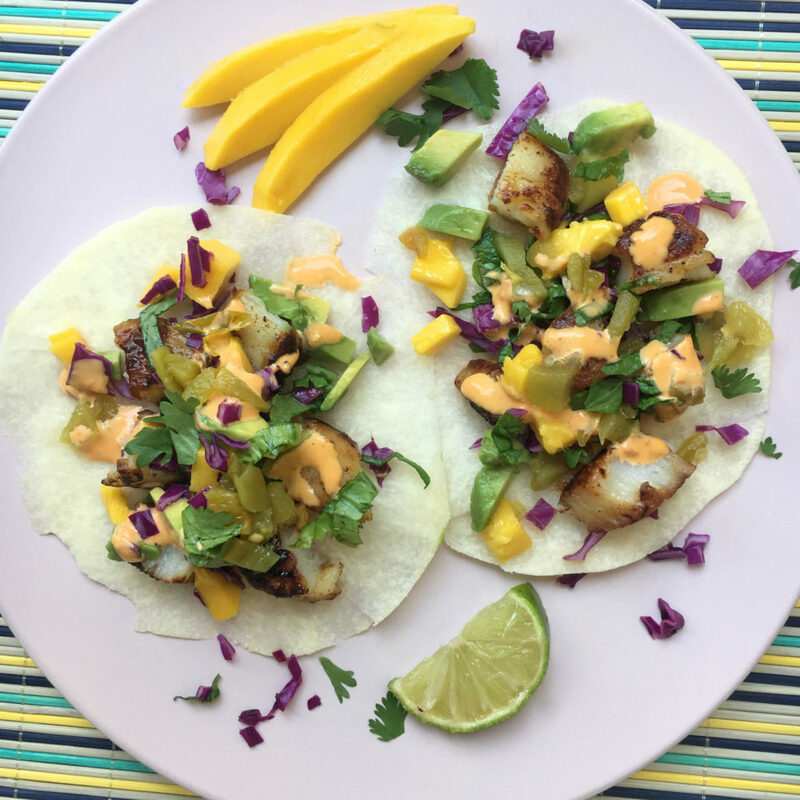 The bright flavors of the chili lime scallop marinade will have you asking for seconds and thirds! 1) Dry the scallops with a paper towel. In a medium bowl add the scallops, juice of one lime, paprika, chili powder, cumin, salt & pepper and combine. Let scallops marinate ½ hour in the fridge. 2) Heat olive oil in a skillet over medium high. Add scallops and sear 3 minutes on each side. Remove to cool. 3) Slice jicama into thin “taco shell” rounds. The easiest way to get a thin slice is to use a large mandoline or carefully use a serrated knife. 4) To make Sriracha vegenaise add all ingredients to a bowl and combine thoroughly. Let chill in the fridge for at least 10 min. 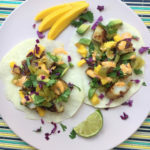 5) To assemble tacos arrange the scallops on jicama slices and top with avocado, mango, cilantro, red cabbage. Then drizzle with sriracha vegenaise. Enjoy!